As an increasing number of designers now cross the divide between print and Web—and further between Web, tablet, smart phone, and a vast number of devices where designs must hold their own—Adobe has crafted InDesign CS6 to be the workhorse to carry the heavy load. InDesign takes over many tedious and time-consuming tasks, from gathering and saving content to mocking up pages for different devices, so designers can concentrate on the creative process rather than on mechanics. Here are the highlights of the new InDesign CS6. 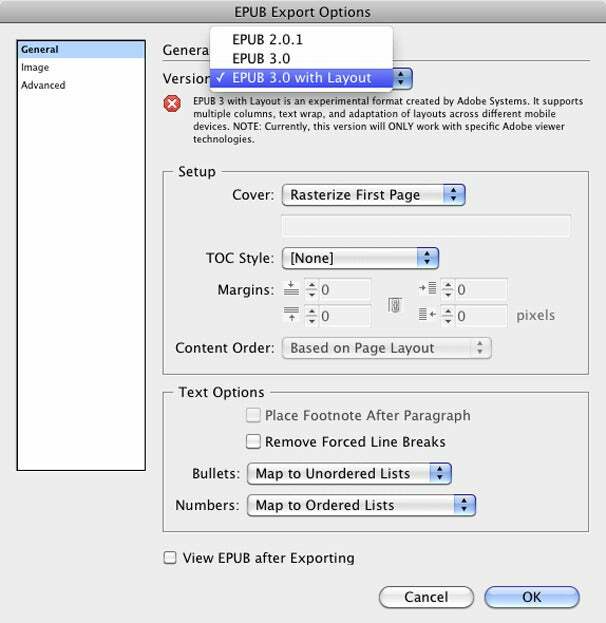 Alternate Layouts Before CS6, if InDesign users needed to produce multiple dimensions and formats for one publication, they had to create and maintain separate documents or duplicate objects onto multiple page sizes in a single document. With CS6, you can add one or more alternate-sized layouts to an existing InDesign document, and InDesign copies your existing content onto the new page size. 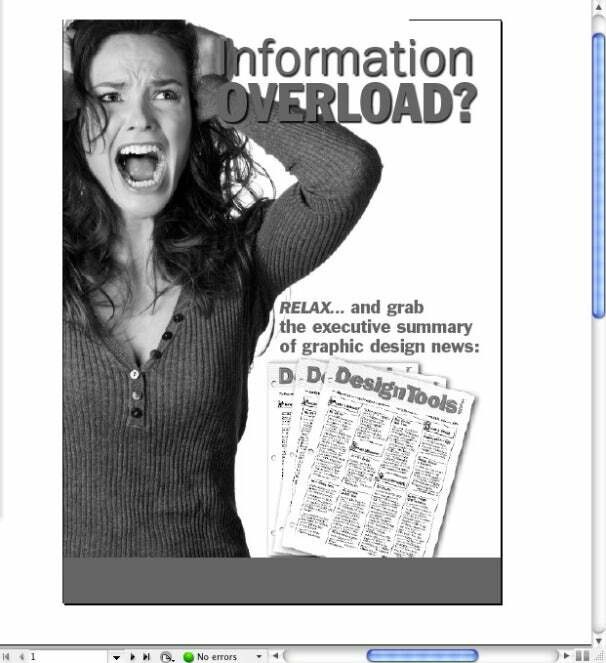 This ad is intended for an iPad magazine, and is shown in both its vertical and horizontal orientations. 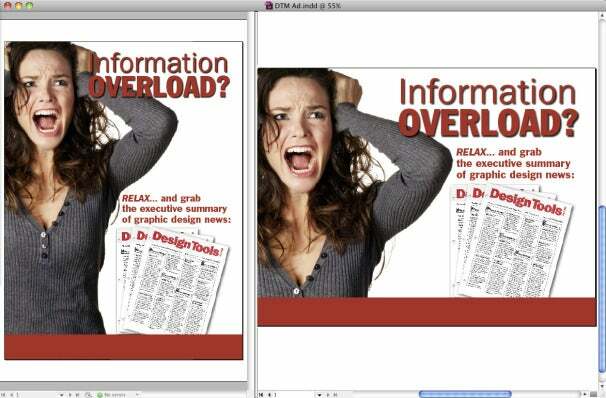 These two layouts exist within one InDesign document, and are shown side-by-side using the new Split Window feature. 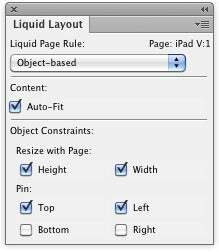 The Liquid Layout panel provides controls over how every page object, or the entire page, is handled when InDesign re-shapes it for new page dimensions. This item will resize in both height and width, with its top left corner “pinned” to the page (to not move). Liquid Layout When InDesign converts a layout to new dimensions, it resizes and repositions objects based on Liquid Layout rules you defined or chose for each page or object. If the shape of your new layout isn’t much different from the original, you can choose a simple Scale or Re-center rule. Linked Content As you might imagine, keeping track of changes that occur simultaneously in multiple layouts can be a logistical nightmare. Adobe’s approach to managing text and graphics that should remain consistent across multiple layouts is similar to the concept of placed graphics. 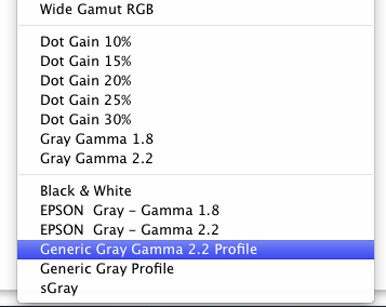 When you place a graphic into an InDesign layout, it isn’t copied into the layout—InDesign merely remembers its location on your network. If you change the graphic in another program, InDesign’s Links panel warns you that it has changed and you can choose to update it in your layout. When linking text frames, you can’t link just the words—styles are always linked too. 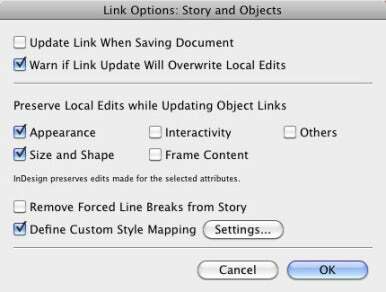 Use the new Link Options in the Links panel to apply a Style Mapping rule to the child frame to control its appearance. You can also preserve changes to the child frame such as appearance, size, shape, frame content, and interactivity. 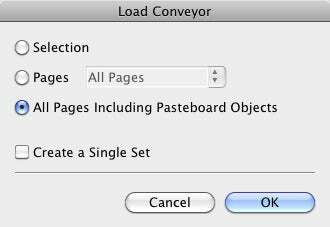 The Content Conveyor holds objects you wish to use in other layouts or documents. When dragged onto the page, objects can be linked to their original (Parent) objects, so that when the Parent changes, the Children can be updated with the changes. You can add objects to the Content Conveyor by clicking on them in your layout, or through the Load Conveyor dialog. This dialog lets you select multiple objects to add them as one Conveyor item, or add all the objects from one or more pages. The EPUB Export dialog box has been redesigned, and EPUB documents now support custom bullets and numbers and more-robust tables. Here’s how the layout will look if printed in grayscale, or exported to PDF as grayscale. You can now preview your layouts as they will appear if printed in grayscale. 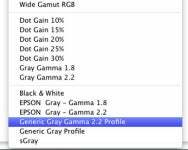 These grayscale profiles appear in list of profiles in Proof Setup. Font menus now list your most recently used fonts at the top. Preferences let you control the number of fonts it remembers, and whether it lists them alphabetically or chronologically.